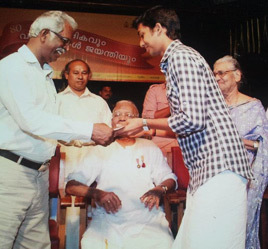 Aravind receiving Vallathol Endowment from Kalamandalam Vice Chancellor Sri. J Prasad. 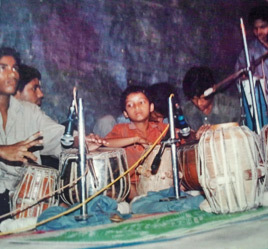 Young Aravind playing the tabla. Some years ago a young boy witnessed a Kathakali performance on television. The images that played out a dramatic excerpt from the Hindu scriptures were indelibly imprinted on the youthful mind and he began watching this programme every day. Thus was born in him, the determination to study this art. That young boy was to become Kalamandalam Aravind. He gave a hint of his artistic bent while studying in the 2nd standard, when he decided to learn to play the tabla. Born on the 2nd of May 1989 to Sri Ayyappan (Retd. Pool Officer, Calicut University) and Smt Sobhana Devi (Teacher, St. Paul’s English Medium HSS,Thenjipalam), he hails from an ordinary family. His elder sister Archana Rajesh is a teacher in Sharjah. His all absorbing interest in the ancient art was accepted by his family who did not question the wisdom of his choice. In 1999, he started to learn this art from Kalamandalam Sajan. In the academic year 2000 – 2001, he joined Kerala Kalamandalam, the premier institute teaching Kathakali and his first Asan’s (Guru’s) alma mater, in the 8th standard. Here he studied Kathakali Vesham under distinguished Asans, like Kalamandalam Balasubrahmanian, Kalamandalam Ramdas and Kalamandalam Krishnakumar. He was awarded the Government of India Scholarship for Young Artistes. After finishing schooling there, he pursued further studies and passed the Bachelor of Arts degree with the first rank. He took his Master’s degree from the same institution, while studying with the Government of India’s Scholarship. Talent and erudition notwithstanding, for a career in this field, it is essential for an artiste to be a performer. 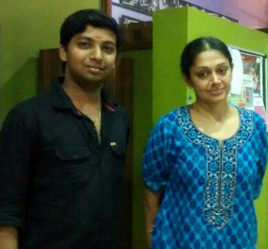 While studying, Aravind got some opportunities to perform as part of his institution’s programmes. However it was on completion of his academic pursuits that his dreams saw true fruition. Kalamandalam Aravind is first and foremost a Kathakali dancer. He has trod the stage in various guises, as a winsome female character, as a brave warrior and as a villain, evil to his core. As a dedicated dramatist, as a committed dancer he imbibed the role when he donned his vesham and saluted the oil lamp lit in the green room, so that he stepped on stage transmuted. As had been transformed the artistes before him, down the corridors of the past. Into a world where make-believe becomes true to life. New opportunities gave rise to new thoughts. While respecting and following tradition, he asked if there was not scope within this medium for experimentation. To achieve this he had to call upon skill that he knew existed in him. His skill as a dancer enabled him to include other forms like Kerala Natanam in a choreographed sketch from the life of Radha who was Lord Krishna’s beloved. He paints a picture of how mortal coils prevent us from realising our love for the divine. From this was born his composition Radha-Madhavam. It is an untried adaptation of excerpts from the immortal story of Krishna and Radha along with an imagined story of misguided love. It blends the grandeur of Kathakali with the vivacity of Kerala Natanam into an amalgam of utter, sublime beauty. The whole is amply supplemented by the musical accompaniment of instruments used in both the dance forms and by vocals that evoke the transcendental romance of the story. It was well received when it was first presented at the temple town of Guruvayur and later at Oorakam Mahadeva temple. This encouraged the team to elaborate upon the theme making it more of a visual treat. Radha-Madhavam is now complete. But Aravind is not content to rest on his laurels. He is now planning to choreograph a dance-drama based on an elusive character from the epic Ramayana. Urmila is known to us only as Sri Rama’s younger brother Lakshmana’s wife. However there is a deeper and more meaningful aspect to that character. When he is not busy performing, Aravind is intensely involved in researching this enigmatic character. He hopes to give the world a delectable treat in the form of a ballet based on her life. MA from Kerala Kalamandalam Deemed University. 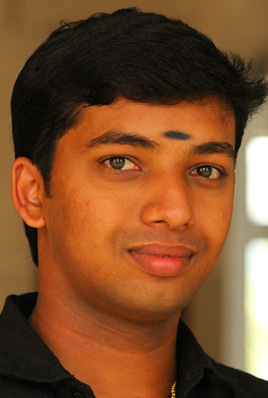 BA from Kerala Kalamandalam Deemed University (pass with First Rank). 2014, National Nrithya Siromani award. 2009-2010, Vallathol Endowment from Kerala Kalamandalam.